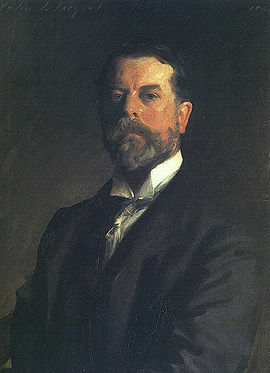 John Singer Sargent was a noted portrait painter. He was considered to be the most successful portrait painter during his time. His body of work included roughly 900 oil paintings and over 2,000 watercolor artworks along with numerous charcoal drawings and sketches. Sargent was born on January 12, 1856 in Florence, Italy. His parents, FitzWilliam and Mary, lived an almost nomadic life that led them to travel frequently. Sargent’s father was an eye surgeon in Philadelphia. The couple decided to go abroad after Sargent’s mother Mary suffered a mental breakdown following the death of his older sister at the age of two. The travels were meant for Mary to recover from the strain. Young John Singer Sargent was known as an outgoing child early on. He preferred the outdoors rather than the stifling environment of the indoors. This might have been a result of the family’s frequent travels and leading an almost nomadic life around Europe. Sargent was not interested in indoor instruction and failed several times in trying to get some satisfactory formal education. Sargent’s mother, Mary, believed that the young Sargent would learn more by traveling around Europe to visit museums and churches. She was also an amateur artist that provided Sargent with sketchbooks and encouraged drawing excursions. Sargent was given watercolor lessons at the age of thirteen by Carl Welsch, a German landscape painter. And although Sargent did not complete his formal education, he otherwise grew into a highly literate young man by virtue of whatever education his parents provided him. Because of his talent in the arts, Sargent was able to gain admission at the Ecole Beaux Arts in Paris in 1874. He took drawing classes and well as went into a long period of self-study by visiting museums and painting in a studio shared with another artist. He eventually flourished as an artist where his talent and skill was immediately noticed. Sargent’s career started in around 1879 when he made a portrait of his teacher Carolus Duran which was exhibited at the prestigious Paris Salon as a tribute to his teacher as well as to showcase his talents for making portraits. This led to further exhibits in the 1880’s. But Sargent’s controversial non-commissioned portrait titled as Portrait of Madame X in 1884, showing a painting of Madame Pierre Gautreau created such a furor in France that led Sargent to move to London. Sargent then build up his broken reputation back up slowly in London where the public eventually accepted and appreciated his talent in portrait painting. He also traveled to the United States in 1887 to 1888 where Sargent also received several portrait commissions. Sargent became very busy as a portrait artist where his renown became more widespread. Commissions and commissions came from many patrons that kept him busy throughout the 1880’s. In 1907, at the age of fifty one, Sargent closed his studio to stop painting as a profession. But he continued painting without the hassles of commissioned work. He focused on doing many of his landscapes during this period. He also did commissioned portraits every now and then. Sargent died on April 14, 1925 at the age of 69.